Middle Eastern flavours combine perfectly with tender lamb chops in this simple, quickly cooked dish. Look out too for our Tastes of the Middle East brochure. To make the houmous, place the chickpeas, tahini, garlic and lemon juice in a food processor and blend until smooth. With the motor running, drizzle in the olive oil to form a smooth cream. Season. Transfer to a bowl, cover and leave to one side. Cut each aubergine lengthways into six thin slices, brush both sides with olive oil and season. Cook on a preheated ridged iron grill pan for 5 minutes, turning once, until soft and browned. Keep warm. Mix together the salt, paprika and cumin and sprinkle over the chops. Grill, on a ridged iron grill pan, for 4 minutes on each side, or until done to your taste. 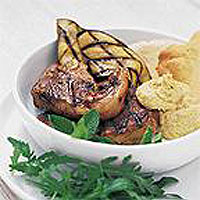 To serve, place two or three lamb chops on a warmed plate and top with a spoonful of houmous. Add a slice of aubergine and garnish with fresh mint leaves. Serve with warm pitta bread and Waitrose Rocket Salad.